I mentally tell myself to “stay strong!” and I physically try to maintain my composure. But leave it to the onions to make me tear up and get a little bit weepy. Every. Single. Time. Why do our eyes have such a strong reaction to cutting up a simple vegetable? Onions contain sulfuric compounds, which are what contribute to their strong flavor and odor. Onions also contain an enzyme called synthase. When we cut into an onion, we are breaking down its cell wall, which releases synthase into the air. This enzyme reacts with the sulfur and produces a potent chemical irritant known as syn-Propanethial S-oxide. When this gaseous irritant comes into contact with your eyes, your lachrymal (tear) glands go into overdrive as a protective measure to clean your eyes out. Then why do some people seem to be unbothered and unaffected by cutting onions? Different people may have different reactions to this irritant based on how sensitive their lachrymal glands are. Don’t fear—cutting onions does not have to be an emotional experience every time. Turn on the vent or fan. This will help air circulation so the gas does not come into contact with your eyes as quickly. Refrigerate or chill onions before using. The enzymes in chilled onions are less reactive than in warm onions. 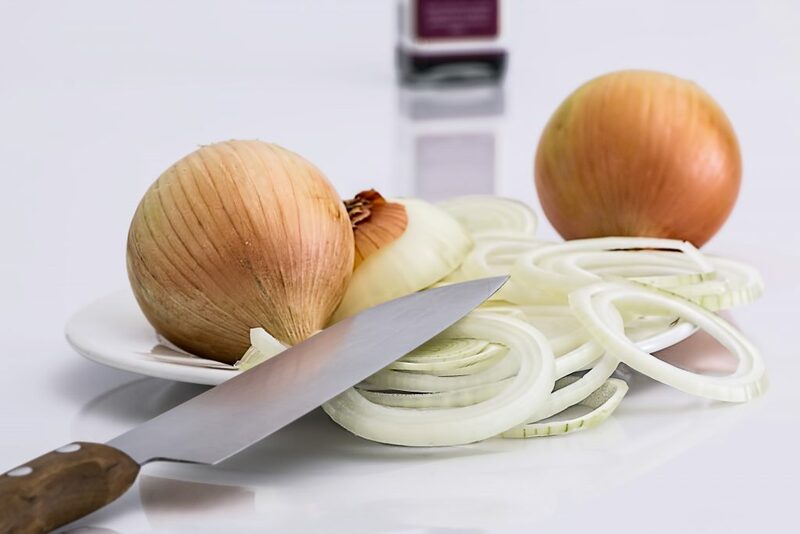 Even putting onions in the refrigerator for 10 to 15 minutes before using can help reduce the sting-factor. It may look a little silly, but protective goggles can keep you tear-free.